General Graardor is often considered the easiest of the God Wars Dungeon bosses. His primary attack is melee, he has a strong secondary ranged attack, and the three minions in the boss room also attack with all three combat styles, melee, ranged and magic. For this reason it’s impossible to negate all damage with protection prayers (unless you are extremely skilled at prayer flicking). The most common tactic to use at Bandos is to use melee, while wearing high defence armour, paying particular attention to range and magic defence. You can then use the protection from melee prayer to negate all of General Graardor’s melee attacks. It is, however, possible to use both ranged and magic strategies, making General Graardor one of the most flexible bosses in terms of your options. Due to the high price of General Graardor’s drops, like the Bandos Hiltand the low difficulty level – Bandos God Wars is a popular group activity amongst groups of friends and clans. God Wards Dungeon Notes – You will need to bring one rope to gain access to the dungeon for the first time and access to Bandos’s corner of the dungeon requires you to bring one hammer (Dragon Warhammer works too). When entering the dungeon, you will take damage from a variety of different monsters if you are not properly prepared. There are certain god-aligned items you can equip in order to give yourself protection from that specific god’s followers. For example, equipping a Bandos Godsword while in the dungeon will make all minions in the dungeon which are aligned with Bandos non-aggressive. The protection needed in order to have full protection in Bandos’s corner of the dungeon is Armadyl, Bandos and Zamorak. Many players will often only bring a Bandos and Zamorak item as that will give you enough coverage to get your 40 kills and enter the Bandos boss room comfortably. NOTE FROM EDITOR: If you do not own Scythe of Vitur, you will do much more damage per second with the Ranged DPS variant. The ranged variant with Dragon Darts still beats the Scythe variant, however it is very close in cost and damage. You will take less damage utilizing the ranged variant making it overall better. Melee DPS at General Graardor has the job of killing the boss while the tank holds aggro on the boss. 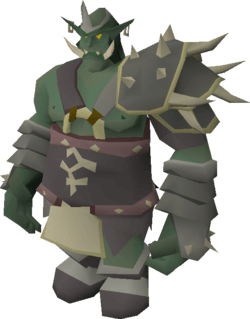 General Graardor is somewhat unique as he is one of the few bosses that will target the first person to hit him until they either stop attacking him, or they die. From an operational perspective the build is very straight forward. The rapier is only used for killing General Graardor’s minions when you do not need to heal. If your health is below 99 after killing the General, switch to your Guthan’s equipment and kill the minions. You will be carrying the runes for Potion Share as well as Vengance. Every 30 seconds you will cast Vengance on your tank, and between fights you will cast Potion Share to keep the combat stats of your tank topped off. It will be important to keep your strength level at 118, as the Scythe of Vitur, in full max strength gear, gains +3 max hit at 118 strength (+1 x 3). As the melee tank at General Graardor, your role is to hold the aggro while your teammates dish out the damage. You must ensure that you are the first player to deal damage to General Graardor when he spawns in order for him to attack you. You should use the protection from melee prayer in order to negate General Graardor’s melee damage, meaning you will only be taking damage from his ranged attacks and the ranged and magic minions. If you’re unlucky enough to take a hit from these three sources all at once, damage can stack up quickly so it’s important to keep your health high. You can utilize the ‘step under’ technique in order to take less hits from General Graardor. What you should do is hit Bandos twice, then immediately run under him so that he is unable to attack you until one of you move. This will give you a couple of seconds to eat if you need to, and then jump out from under him and immediately return to attacking. The Vengeance spell can be used to reflect some of the ranged damage back at General Graardor, which will help speed up kills. Once General Graardor is dead, you can heal up on the minions with your Guthans, and collect and convert the bones on the floor with Bones to Peaches. Once you have mastered all of the above techniques, it’s possible to last a very long time at General Graardor without with a few friends, making it a good team activity for both fun and money making. You can swap out the Saradomin Godsword for another decent spec weapon, like a Bandos Godsword, Dragon Warhammer or Crystal Halberd. As the ranged tank at General Graardor, your role is to hold the aggro while your teammates dish out the damage. You must ensure that you are the first player to deal damage to General Graardor when he spawns in order for him to attack you. You should use the protection from melee prayer in order to negate General Graardor’s melee damage, meaning you will only be taking damage from his ranged attacks and the ranged and magic minions. If you’re unlucky enough to take a hit from these three sources all at once, damage can stack up quickly so it’s important to keep your health high. While using ranged, you should utilize the Ruby Bolts(e) for the first portion of the kill, swapping out to Diamond Bolts(e) when his health drops below 50%. Another very effective option for killing General Graardor is to use magic. Using Ice Barrage will allow you to keep General Graardor and his minions frozen in place, while using Blood Barrage will allow you to heal up. This method does take a little bit of practice and it is not really recommended for lower level players or players without max mage gear. If you’re in a larger group of players, lower level gear will work but if you’re solo or duo, good gear and some prior practice are highly recommended! In your inventory and Rune Pouch, you want to bring runes for both Ice Barrage and Blood Barrage.